William E. Barrett is an excellent author. Known for such classics as The Left Hand of God, Lillies of the Field, and our own The Iron Ace! 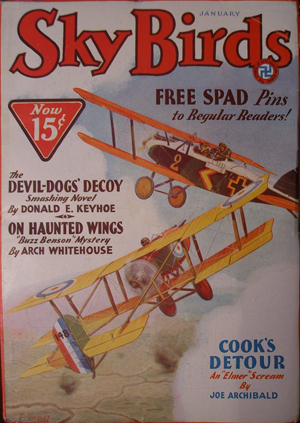 In honor of William E. Barrett’s birthday this past weekend, we have for you a tale of broken wings from the January 1933 issue of Sky Birds. The brothers Cord, one stripped of his honor while the other was honor bound not to fly! Flying high in a blood-red sky, von Sternberg had taken toll of the lives of many men. Over the brothers Cord he had thrown an even grimmer shadow, for he had robbed one of his honor, the other of the right to fly. But wings can be built that are too strong to be broken.